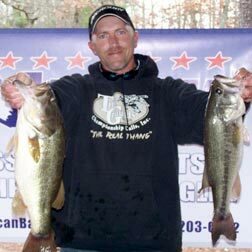 Phillip Anderson of Saluda, SC worked the rocky points to perfection as he won the American Fishing Tour Division 96 bass tournament held on Lake Murray this past weekend, picking up $548 for the victory. He is now one step closer to the 2012 ABA National Championship and the 2012 Angler of the Year Event.Anderson?s five bass limit weighed in at 19.39 lbs, which he caught primarily on a shakey head worm in the middle part of the lake. He earned an extra $100 for catching the Big Bass, of the tournament, a 6.34 lb. beauty of a largemouth bass.Second place went to Sean Anderson of Leesville, SC with a weight of 15.52 lbs, while Jason Theis of Beaufort, SC finished third with 9.34 lbs.These anglers have acquired valuable points to ensure their birth in the ABA National Championship on Grand Lake in Oklahoma the 24th-26th in October 2012. Their points are being used to determine the division?s angler of the year. The top angler by points earned in this division will represent the division in the Angler of the Year Final Round.The top five anglers were:1. Phillip Anderson 19.39 lbs.2. Sean Anderson 15.52 lbs.3. Jason Theis 9.34 lbs.4. Don Kneece 8.48 lbs.5. Earl Purcell 8.00 lbs.For more information on this or any future event in this division contact Phil Morris at (864) 993-0346 or by email at: plmorris109@embarqmail.com.The American Fishing Tour offers low cost, close to home bass tournaments that are designed for the weekend angler. All ABA anglers fish for money and points. The points advance the angler to their divisional championship and the top 500 anglers in the US are invited to the American Fishing Tour National Championship.For more information on fishing tournaments, click here.